The hardest part with this Alien Abduction costume was getting my 11-year-old daughter to decide what costume she wanted to be. After hours of browsing with her on this site she finally chose the alien abduction costume and we were set to go. The costume was very lightweight and easy to handle! 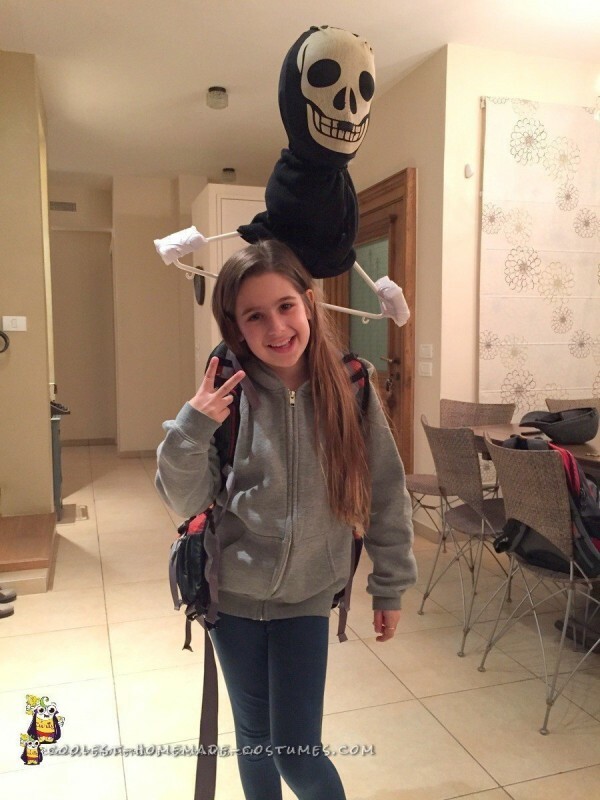 The backpack allowed her to carry things that she needed during the day at school or when out trick-or-treating. 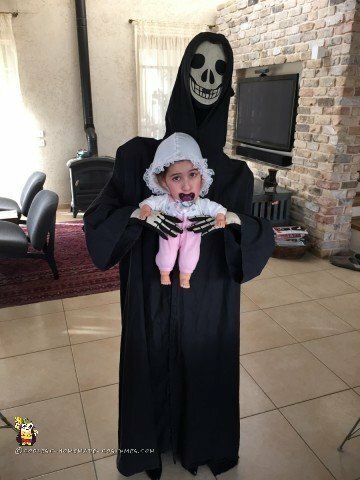 And, once my daughter was done with the costume, I used parts of it for myself with a Grim Reaper (Grim Streaker) twist! 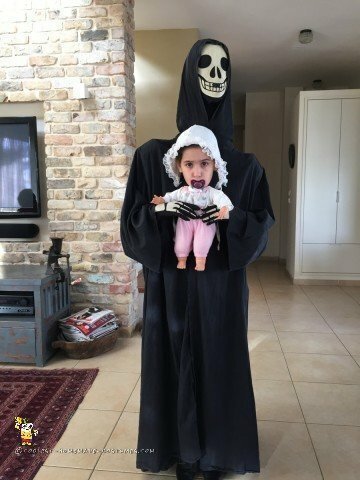 Grim Reaper Mask – We had a glow-in-the-dark morphsuit skeleton costume she wore the year before, so we just separated the head from the costume. I started off by finding an old broomstick and cutting it down to size. My backpack has a slot that was just right for sticking in the broomstick and connecting it so it wouldn’t move. 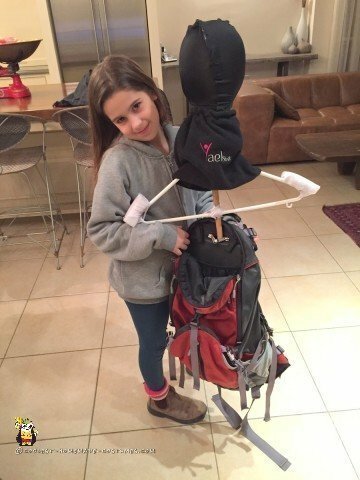 You have to work around your own backpack and find the best way to fasten the stick. I then used vinyl tape to connect a plastic clothes hanger. The corners of the clothes hanger would serve as the shoulders, so I added a bit of padding to them. I sharpened the end of the broomstick and used it as a stake for the Styrofoam head, driving it in until it was completely secure. I took the head we cut off from the skeleton morphsuit and put it on the styrofoam head. 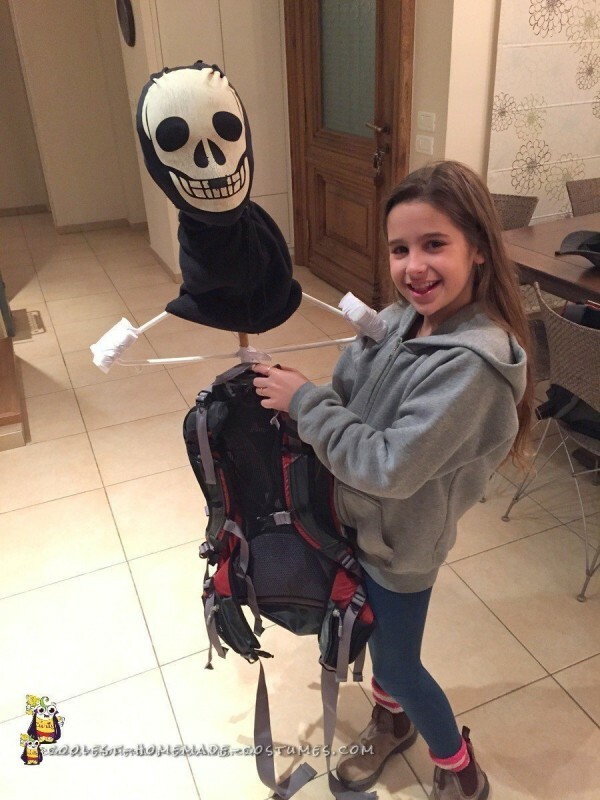 Then I added a black neckwarmer to hide the Styrofoam head’s neck and the top of the clothes hanger. The backpack with the head was very lightweight and easy for her to get on and off. Then we just put the robe over, removed the head of one of her old dolls, put a baby bonnet on my daughter’s head, a bit of makeup, a pacifier and she was ready to go! 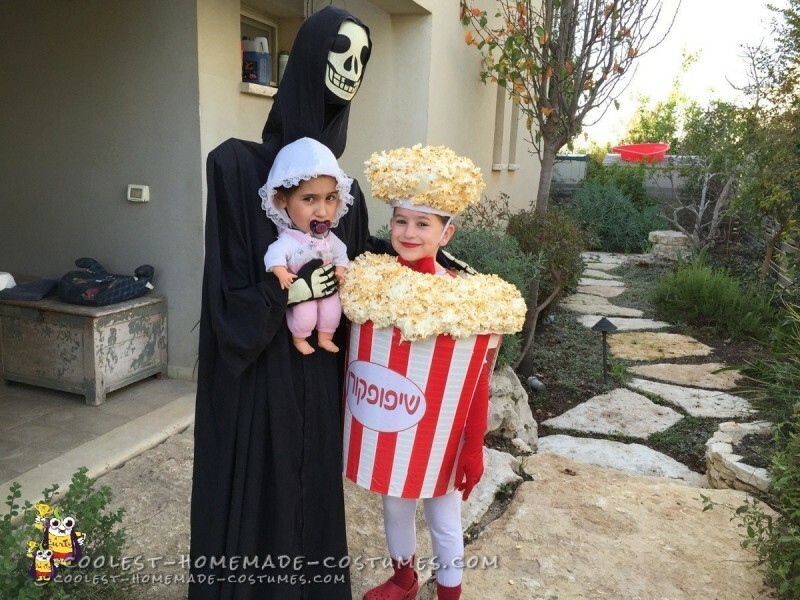 Here she is posing with my other daughter who chose to be a box of popcorn (here’s how we made the popcorn costume). It was also really easy getting everything into the car. About 15 minutes before I was supposed to go to a costume party, and having already accepted the fact that I wouldn’t have a costume, I had an idea. My daughter wouldn’t be using her costume any longer so I could take it apart. 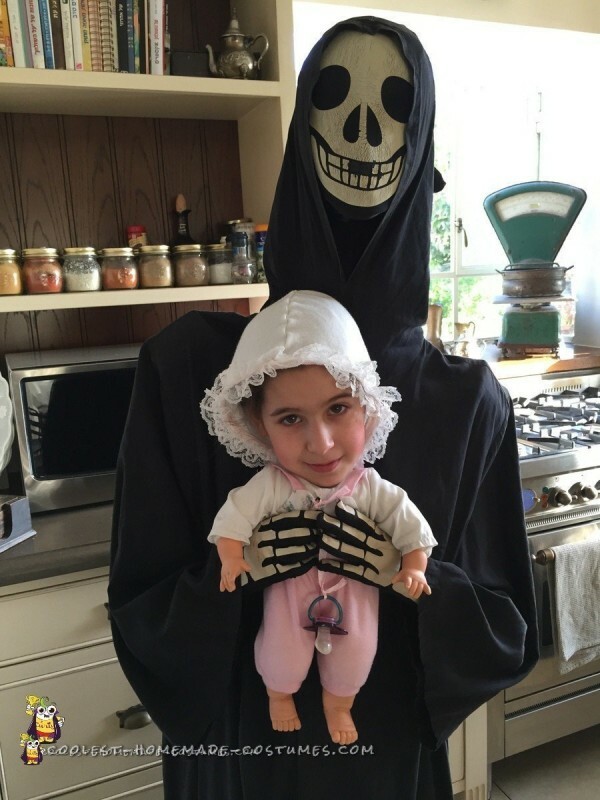 I took the child-size skeleton morphsuit and proceeded to cut it up some more. 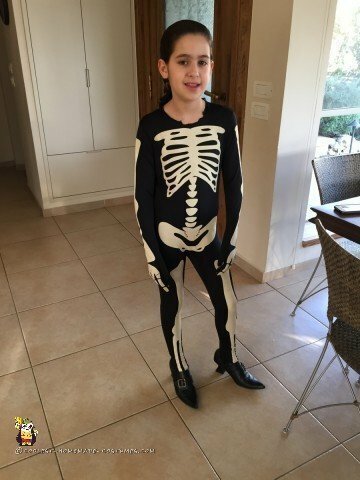 We had already cut the head off and now I cut the legs and the arms. 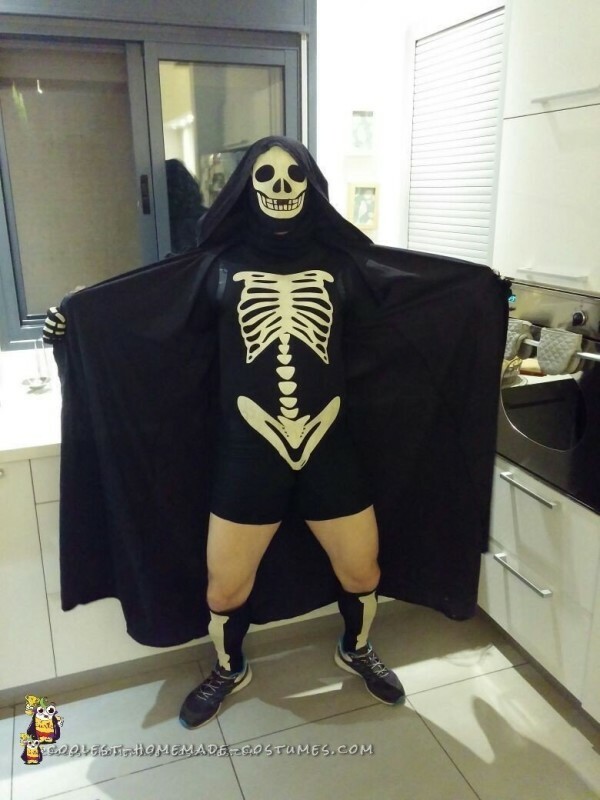 I wore a black skin-tight base layer shirt and shorts and then wore the cut-up parts of the morphsuit. 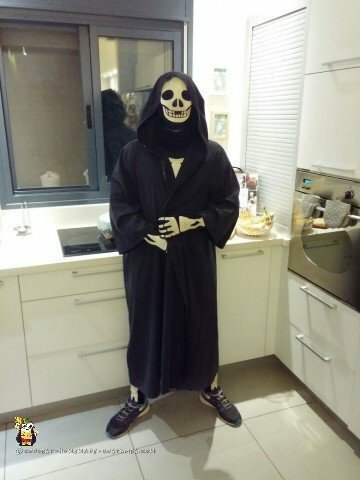 I put on the robe and I was all set. I think we were able to make the most of the one child-size glow-in-the-dark morphsuit. 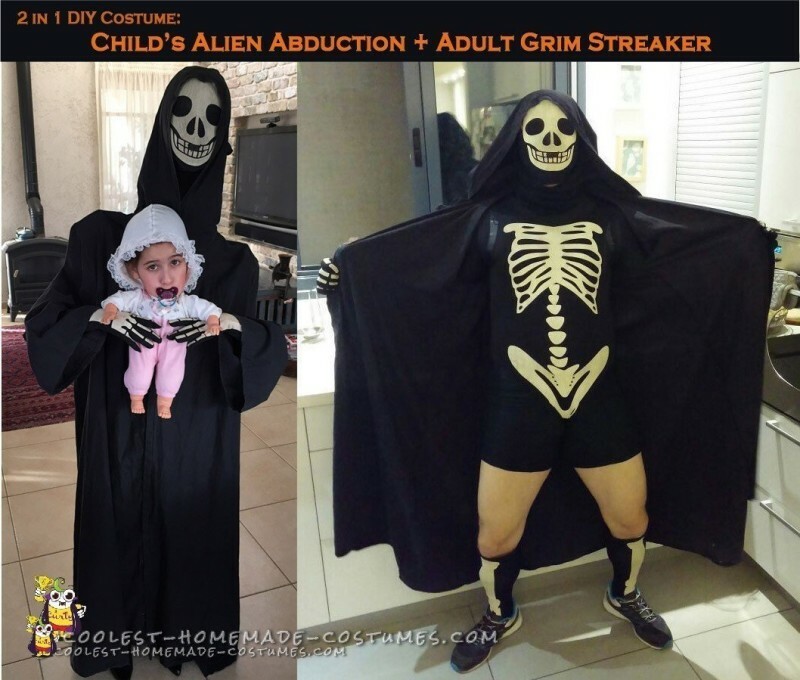 My daughter wore it the year before, she then wore it again as part of her Alien Abduction costume and I wore it as the grim streaker. 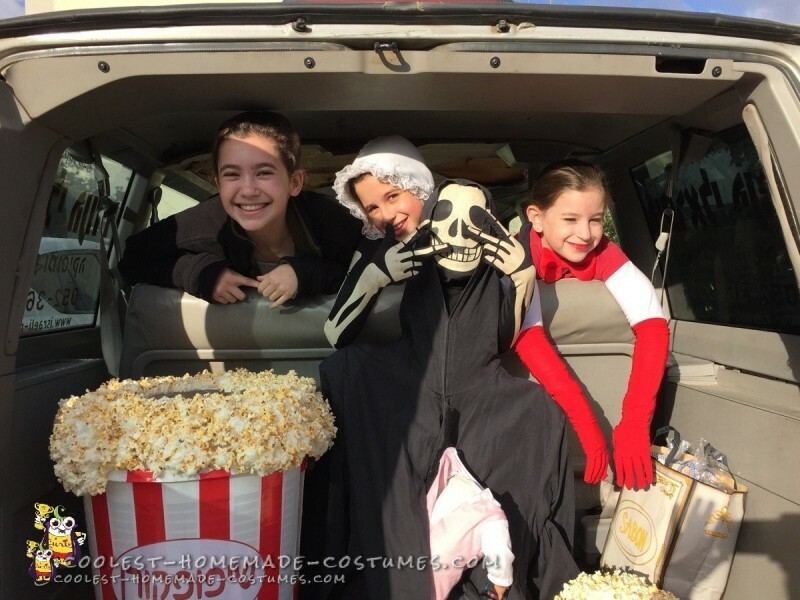 Talk about recycling a costume! I hope this has helped and if you have any questions leave them below.